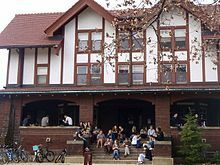 Oberlin College is a private liberal arts college in Oberlin, Ohio, noteworthy for having been the first American institution of higher learning to regularly admit female and black students in addition to white males. The Oberlin Conservatory of Music, part of the college, is the oldest continuously operating conservatory in the country. Students passing through the Memorial Arch in front of Peters Hall. The arch is dedicated to the memory of 15 missionaries of the Oberlin Band who were killed in the Boxer Rebellion. Both the college and the town of Oberlin were founded in northern Ohio in 1833 by a pair of Presbyterian ministers, John Jay Shipherd and Philo P. Stewart. The College was built on 500 acres (2.0 km2) of land specifically donated by the previous owners, Titus Street, founder of Streetsboro, Ohio, and Samuel Hughes, who lived in Connecticut. Shipherd and Stewert named their project after Jean-FrÃ©dÃ©ric Oberlin, an Alsatian minister whom they both admired. The ministers' vision was for both a religious community and school. Oberlin's founders bragged that "Oberlin is peculiar in that which is good," and the college has long been associated with progressive causes. Asa Mahan (1799-1889) accepted the position as first President of the Oberlin Collegiate Institute in 1835, simultaneously serving as the chair of intellectual and moral philosophy and a professor of theology. Mahan's liberal views towards abolitionism and anti-slavery greatly influenced the philosophy of the newly founded college; likewise, only two years after its founding, the school began admitting students of all races, becoming the first college in the United States to do so. A nondenominational seminary, Oberlin's Graduate School of Theology (first called the Theological Department), was established alongside the college in 1833. In 1965, the board of trustees voted to discontinue graduate instruction in theology at Oberlin, and in September 1966, six faculty members and 22 students merged with the Divinity School of Vanderbilt University. In 1844, Oberlin College graduated its first black student, George B. Vashon, who became one of the founding professors at Howard University and the first black lawyer admitted to the Bar in New York State. The African Americans of Oberlin and those attending Oberlin College "have experienced intense challenges and immense accomplishments since their joint founding in 1833. Its African American and other students of color have used education and activism to influence the college, the town, and beyond. Their efforts have helped Oberlin remain committed to its values of freedom, social justice, and service." The College's approach to African Americans was by no means perfect. Intensely anti-slavery, Oberlin was the only college to admit black students in the 1830s. By the 1880s, however, with the fading of evangelical idealism, the school began segregating its black students. Nonetheless, Oberlin graduates accounted for a significant percentage of African-American college graduates by the end of the 19th century. What are the academic rankings for Oberlin College? 1. number 81 for Academics. What universities are similar to Oberlin College?